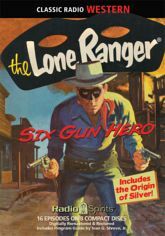 Join the most heroic figure ever to fight injustice on the sweeping plains of the great American West in 16 thrilling adventures! Be there when the daring and resourceful masked rider finds the wild white stallion that he would tame�and name Silver. Ride along through three four-part serials, one of which involves the legendary gunsmith Samuel Colt. Earle Graser and Brace Beemer star as The Lone Ranger, with John Todd as Tonto. WXYZ regulars Paul Sutton, Ernie Winstanley, Jay Michael, and more round out the cast of saddle savvy characters.